Patna/New Delhi June 13, 2012: A statement from National Human Rights Commission (NHRC) has revealed that State government has failed to submit its report on asbestos related diseases. The statement dated June 5, 2012 is attached. NHRC had issued the notice to Chief Secretary, Bihar Government on July 6, 2011. Meanwhile, Union Railway Ministry has started procuring asbestos free products. ToxicsWatch Alliance (TWA) demands immediate steps to prevent environmental and occupational exposure to asbestos' besides non-occupational exposures to asbestos by banning use and manufacturing of white asbestos based products. It will set a healthy precedent for all the other states, the central government and neighboring countries. If a decision is taken ahead of Rio+20, United Nations Conference on Sustainable Development being held during June 20-22, 2012 in Rio de Janeiro, Brazil where a global political document is due to adopted by the Heads of States to mark the 20th anniversary of the 1992 Earth Summit, it will enhance State’s prestige among the comity of nations. A program titled "Deadly Business – Asbestos: Are you the next victim?" is planned at People’s Summit at Rio on June 15, 2012. ToxicsWatch Alliance (TWA) demands that Chief Secretary ought to take cognizance of the incurable diseases caused by white asbestos. It is high time he intervened to stop any asbestos plant from being set up in the State because among other things it damages the reputation of the State by showing complete absence of scientific temper. Chief Secretary should submit its report on victims of Asbestos diseases to the NHRC at the earliest announce compensation package for present and future victims of these incurable lung diseases. The attached TWA’s paper on Status of Hazardous White Asbestos Factories in Bihar gives an overview of the situation. 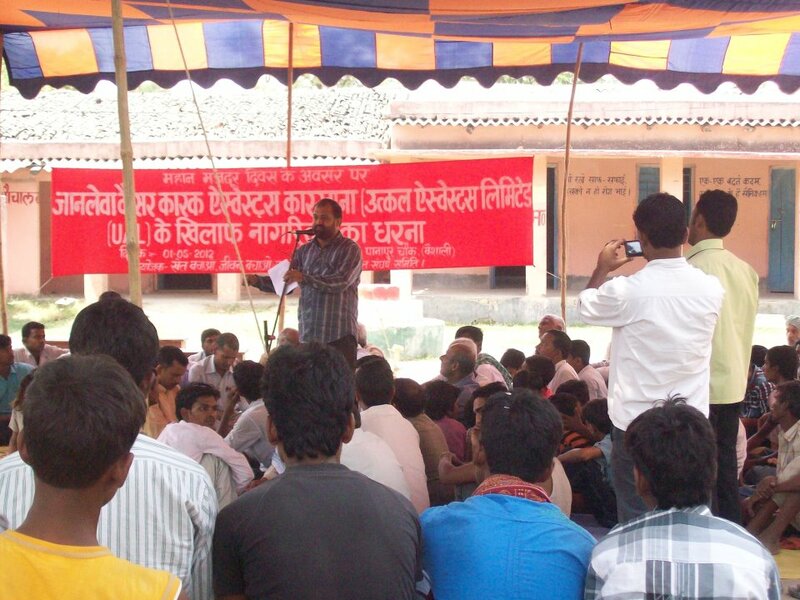 Underlining the importance of NHRC’s notice, villagers of Vaishali’s Chaksultan Ramppur Rajdhari near Panapur in Kanhauli Dhanraj Panchayat of in Goraul block have decided to hold a Mahadharana against the proposed white asbetsos plant of Utkal Asbestos Limited (UAL) company in their village on June 14, 2012. Their pamphlet is attached. Villagers have been proesting against the fake public hearing and faulty environmental clearnce under the banner of Khet Bachao Jeevan Bachao Jansangarsh Committee. 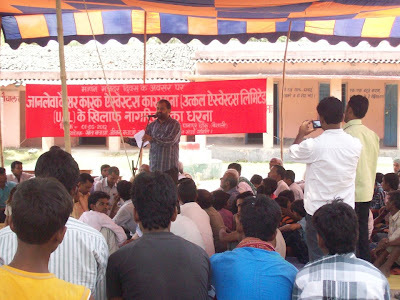 They had organised a public meeting in this regard on May 1, 2012 as well wherein local officials were also present. State Government should persuade the central government which does not favour new asbestos plants in the country in principle to translate its pious intention into practice. "The Government of India is considering the ban on use of chrysotile asbestos in India to protect the workers and the general population against primary and secondary exposure to Chrysotile form of Asbestos." It has noted that "Asbestosis is yet another occupational disease of the Lungs which is on an increase under similar circumstances warranting concerted efforts of all stake holders to evolve strategies to curb this menace". A concept paper by Union Ministry of Labour revealed this at the two-day 5th India-EU Joint Seminar on “Occupational Safety and Health” on 19-20th September, 2011. (Reference: http://www.labour.nic.in/lc/Background%20note.pdf). In this regard the attached New Delhi Declaration Seeking Elimination of all forms of Asbestos including White Asbestos from India that was issued by world’s renowned scientists, doctors and jurists in March 2011 also merit attention. In a related development, Bihar State Human Rights Commission (BSHRC) announced that the white asbestos plant that was under construction in Chainpur-Bishunpur village, Jakhra Sheikh Panchyat, Marwan block of Muzaffarpur has been wound up. The relevant File Note 45/11 Justice S N Jha Chairman, BSHRC is attached. Bihar Government should take note of the Union Environment Ministry’s 19 page Vision Statement on Environment and Human Health (Para 4.3.1) on page 12 which reads: “Alternatives to asbestos may be used to the extent possible and use of asbestos may be phased out”. The same is available at moef.nic.in/divisions/cpoll/envhealth/visenvhealth.pdf.